Marcus Murray had just completed the scoop of his journalistic career. When his editor suggests he return to Medway, his hometown, to write a story about the body uncovered in the building of the Cross Euro Speed Link, it feels curiously as if he’s being punished. A return home is always difficult, not just because he feels guilty for rarely visiting his mum, but because he can’t help thinking of Melanie, his best friend who disappeared in 1990. Forced to leave private school for the local comprehensive, it was Melanie who helped Marcus navigate his new world and Marcus idolised her. She seemed fearless to him, moving ‘as if she skipped through the world unchanging, untouched by her environment’ (page 31). As Marcus’s career starts to come unstuck so too does his past. The uncovered body, a dead-end story with little mileage for the paper, has personal ramifications that compel him to relive those months before Melanie disappeared. Written in chapters that alternate between a first-person contemporary Marcus and a third person account of Marcus as a teenager, the novel is more than a thriller dragging skeletons from the cupboard. So The Doves is about our inherent need to create stories of ourselves and of others, stories that are always interpretive and reductive. As such, James turns a sharp eye on class, race, gender and sexuality in an England of the late eighties and early nineties as well as today. Our desire for meaning, a way to understand the chaos of the world around us, often obscures rather than explains reality. Melanie helps Marcus to see this, eventually. Giving people a story, Melanie argues, ‘it’s like all romance and glitter and rags, as if it isn’t enough to just be a person who doesn’t fit, because that isn’t worthy of respect’ (page 97). Just as we invent those we love, creating narratives for them in which we form central parts, so too do we judge those different from ourselves. This makes Heidi James’ novel searing and disquieting as well as page-turning. We aren’t often asked to question our class stereotypes. We’re meant to pretend they no longer exist. 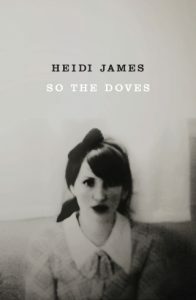 Alongside the beautiful, concrete descriptions of feeling and place, that both fit Marcus’s journalistic eye for detail and a reader’s desire to see with fresh clarity, So The Doves is a complex and hard-hitting novel that brings a thrilling edge to Heidi James’ body of work. Not only is So The Doves an exploration of the human need for narrative, it is also a study on the importance of friendship. Whether you fancy dabbling in a little late 20th Century nostalgia, trying to figure out the reasons for a young woman’s disappearance, or contemplating narrative and friendship, So The Doves has something for everyone. I’m therefore delighted to be able to offer five signed copies of So The Doves to the first five people who comment on this blog post requesting a copy. Go on, what are you waiting for! If you miss out on the book giveaway, you can buy copies of So The Doves, published by Bluemoose Books this September, in all good bookshops, or online here. Bluemoose always publish interesting stuff, can’t wait to read this one. I’d love a signed copy! Hi Phil, Couldn’t agree more. You’re one of the first to reply. I’ll be in touch via email about that signed copy! I would love a copy, if there’s one still going – sounds really intriguing, and Iove the cover. Thanks Justine. I’ll be in touch via email. You’re one of the five! Thanks Tracey. I’ll be in touch via email. You’ve got a copy! I recently had the pleasure of being a student i Heidi’s class at the British Council in Athens. Would love to read her new book!! Thanks Gigi. There is a signed copy with your name on it. I’ll email you for further details. If there’s still a copy going I’d love to read it. Paul. You snuck in there, Paul. The last copy is yours. I’ll email you for further details.